The most basic of solid toiletries is one we often look down upon – a simple bar of soap, the most versatile of which is Dr. Bronner’s soap. Last year I went to find out whether you really could get all 18 alleged uses out of it and you can read all about it in THIS blog post. It really is a life saver and in theory you don’t need anything else except a toothbrush to be a happy and clean backpacker. It doesn’t get more minimalist than that. Looking around the shops I came across a wide range of products, some of which I’d already used, some of which were completely new to me. I bought a few trinkets, tried them out and here is what I think. You could use Dr. Bronner’s soap. However, I find it leaves my hair mucky after a few washes. 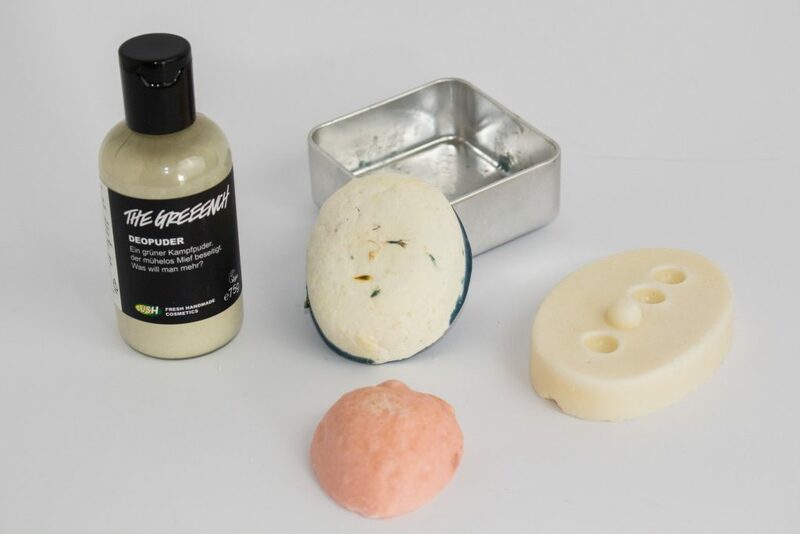 I have used various shampoo bars from Lush for the last couple of years, especially when travelling but also after yoga and even at home because I really love the smell. My favourite scents are Jumping Juniper (unfortunately only available online), M… and Seanik. If your hair needs more TLC Lush also has conditioner bars available. No one likes a smelly traveller and, let’s be honest, no one wants to be a smelly traveller in the first place. While I will use Soapwalla’s DEODORANT at home, on the road my favourite product is the NAME bar, also by Lush. You simply use it like your regular deodorant. 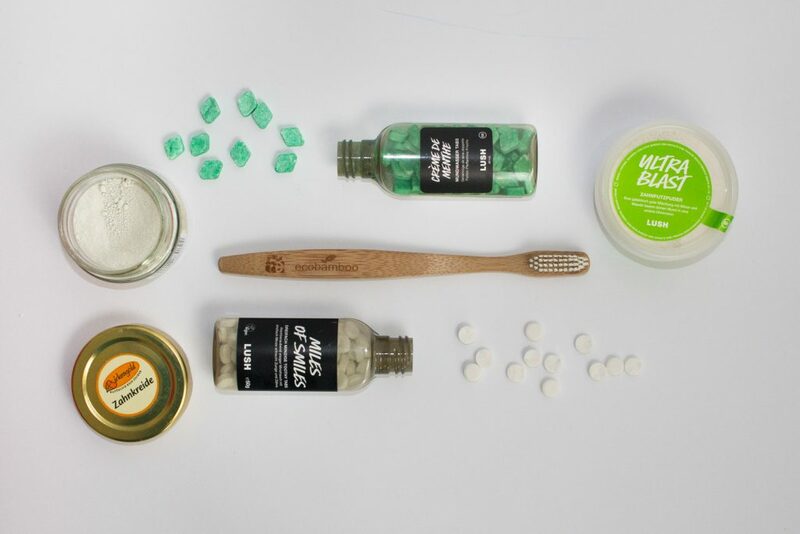 At some point you will want to clean your teeth and while I’ve used Dr. Bronner’s soap for this also, there are other products I prefer, even though to be honest when I’m able to choose I will still go for the traditional tooth paste. A few brands offer tooth powder in a little box. You wet your toothbrush and gently press it into the powder, then brush your teeth. The powder I’ve tried doesn’t foam much, but still leaves your teeth clean once you’re done brushing. Also, it contains xylitol (birch sugar) which is allegedly beneficial for your teeth. Lush also offers toothy tabs. These are small tablets you chew up with some water before using the resulting froth like tooth paste. While I love the idea – and the fact that they come in quite a selection of flavours, from traditional mint to cinnamon – I still have to master the handling. What I’ve become a big fan of, however, are their mouth wash tabs! They are the same size and a very similar consistency as the toothy tabs, only will you use slightly more water to chew them up with, then rinse and spit. My favourite is their minty flavour (mint just tastes clean to me). This was by far the trickiest category and I searched wide and far before finding products that not only qualified but that I also liked. 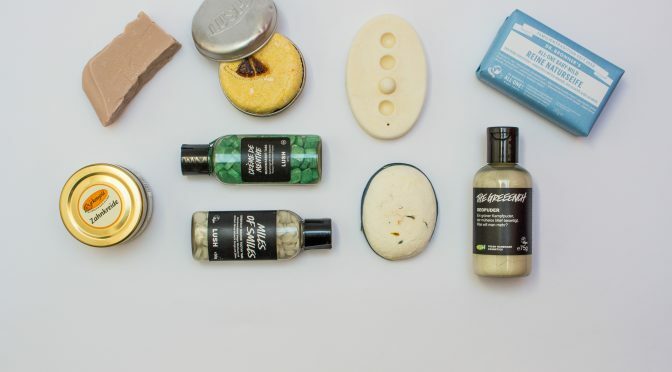 Once more, Lush takes home the crown by offering their so-called massage bars. They consist of nut butter and only a few other ingredients and will melt into your skin as you rub them on. Yes, you will need to apply some light pressure on your skin so be careful if you’re super sensitive. However, the texture is amazing and there are plenty of scents/ flavours to choose from and they seem to last forever. For our upcoming trip I gifted myself with the Therapy bar. 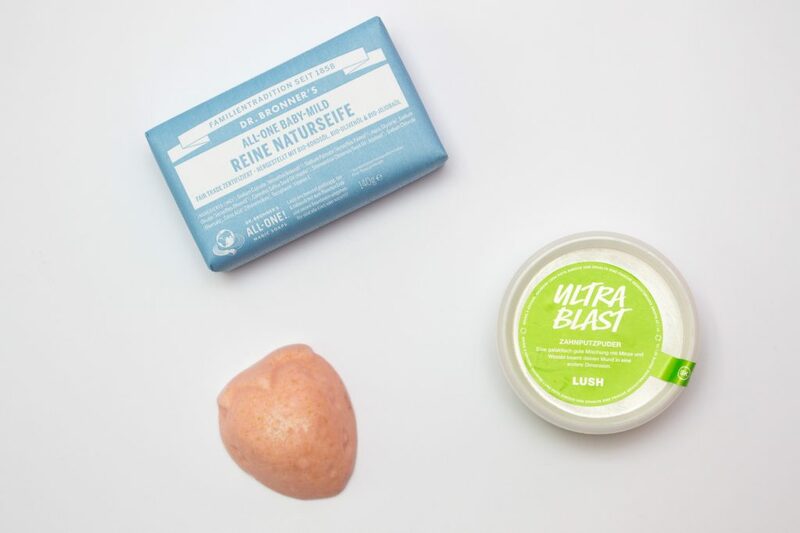 One lucky person will receive a go-travel package including: a bar of Dr. Bronner’s soap, the Ultra Blast tooth powder by Lush* and a strawberry-scented massage bar by Lush. To enter, simply leave a comment on what kinds of solid toiletries you’ve been using and what your experience has been. The winner is drawn by random. Open until 07 May 14 May 2017 to everyone with an address in Austria. I use hairsoap from Savion and it makes my hair shiny. I like the smell of “johanniskrautöl” and “thermalwasser”. Its a german brand and there is no plastic used for package. Wie bist du zu der Seife gekommen? Hast du sie geschenkt bekommen oder hat sie dir jemand empfohlen? Ich finde Haarseifen super und verwende sie z.B. nach dem Yoga auch für den Rest des Körpers (bisschen Haare sind dort ja auch ;). Danke! Da werd ich mal reinschauen. I am a soap-user for years! Always have an extra piece of soap in the cabinet -the “rest” of a normal bar preserved for trips (which is small but enough for a week and which I can leave in the hotel and do not have to fight with messyness on the way home). What a great way to use up old soaps! My dad likes to take them on his minimum-luggage trips (cycling, hiking etc where every gram counts) and had been looking for a container for quite a while – until I gifted him with a plastic tampons container ^^ He totally loved it and has been using it ever since as a mini soap box. On the topic of soap rests: I collect them in one of those nets that garlic is sold in and use them in the kitchen. The net adds a “scrubbing feature” which comes in handy when your hands got a little more dirty. Just put them in and tie a not. You can easily open it up again when you have more soap to add. 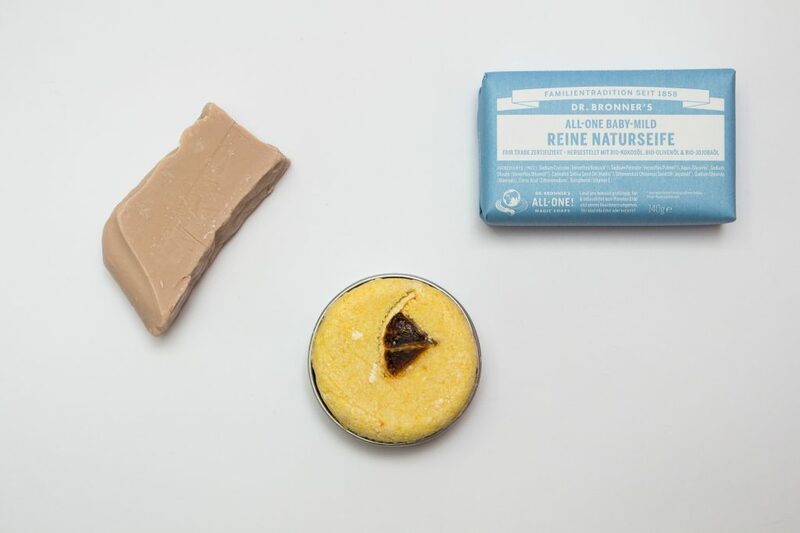 Ich bin begeistert von den Shampoo-Bars. Die Benutzung ist sehr einfach und man kommt ewig damit aus. Mit dem festen Deo von Lush hatte ich leider meine Probleme, aber dafür ist das Deo in Puderform super. Was ist unbedingt noch testen muss, sind die Toothtabs. Ja, das feste Deo fand ich anfangs auch ziemlich kratzig. Mittlerweile geht’s besser. Das Puderdeo hab ich mir gekauft, es aber noch nicht oft verwendet. Die Toothy Tabs hatte ich letzte Woche in Mallorca mit und konnte mich endlich damit anfreunden. 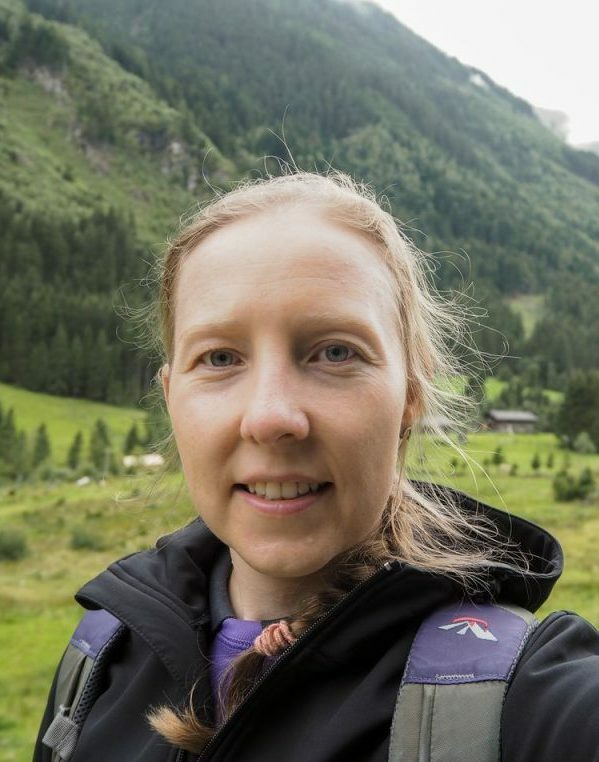 Ich weiß nicht, was bisher mein Problem war, sie sind super 🙂 Noch besser finde ich allerdings die grünen Mundwassertabs – die sind total minzig und ein bisschen scharf (kribbeln auf der Zunge).